Photograph of the library at Lakshmi Vilas Palace in Baroda, Gujarat from the Curzon Collection, taken by an unknown photographer during the 1890s. An immense structure, the palace was built for the Gaekwar Sayaji Rao III (ruled 1875-1939) and was reputedly the most expensive building erected by a private individual in the 19th century. Originally designed and begun in 1880 by Major Charles Mant (1840-81), it was completed in 1890 by Robert Fellowes Chisholm (1840-1915). Both architects were pioneers of the Indo-Saracenic style, an orientalist fusion of Eastern and Western forms. 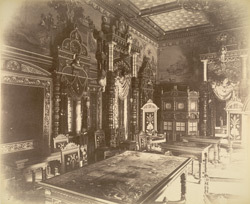 The interior was richly decorated with lavish ornamental detail in this style but was planned and furnished in a largely Western manner, as shown in this view of the library. The Gaekwar’s library consisted of c.20,000 volumes which he donated in 1910 to form the nucleus of the Baroda Central Library. This was established as part of the Baroda Library movement, a campaign to found free state libraries initiated by the Gaekwar.